The boos from the home crowd. The incredible statistic of being outrebounded at an alarming rate. The zero effort. There was nothing good going for the Indiana Pacers as they lost in game 5 of the Eastern conference semifinals to the Washington Wizards, showing some alarming signs about a team that believes they’re good enough to bounce back from anything although in reality they fall short of that belief. Not all is lost for the Pacers. Losing by 23 at home hasn’t stopped teams from winning NBA championships in the past. The Los Angeles Lakers dropped a game to the Portland Trail Blazers in the 2000 NBA playoffs at home by 29 points. They went on to beat the Pacers in the finals. That 2000 Pacers team lost at home by more than 20 points as well that year. The San Antonio Spurs have lost by 21 points to the Dallas Mavericks in these playoffs, and no one is saying they’re not championship material. But there are numbers, and there is the eye test. A team so inconsistent on both ends of the floor that simply shuts down in an elimination game just can’t be championship material. Roy Hibbert looks like an All-Star one day but he has had too many embarrassing moments in these playoffs, with game 4 against the Wizards (4 points, 2 rebounds) joining the expanding collection. When Hibbert’s no good offensively he can at least protect the rim, but the Wizards had no problem scoring near the basket. 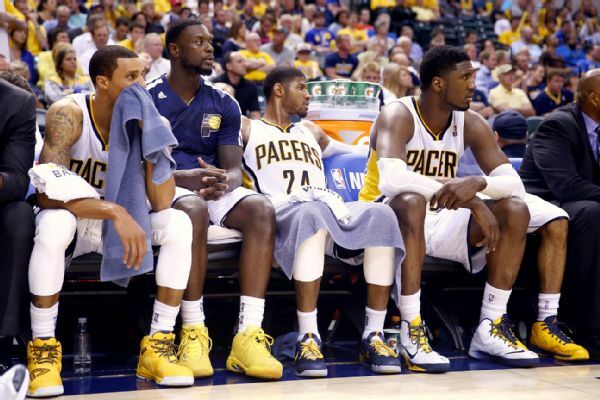 Frank Vogel looks on helplessly and knows that change isn’t coming from the bench. It’s not like the Pacers haven’t tried improving that unit this season. Evan Turner (3.9 points per game in the playoffs) has been a non-factor if he doesn’t actually harm what’s going on. Luis Scola has three bad games for every good one. Andrew Bynum knees will never be the same and he contributed nothing to the team. The rest are players who just fill up the roster, nothing else. It’s incredible to see a team allowing itself to play a game with no effort. It’s either something is holding them back, or they truly believe they’re good enough to play this badly and bounce back like nothing in the next game to finish off the series. One thing we’ve learned from these playoffs is that often games don’t carry over to the next one, and it’s a completely different story each time. 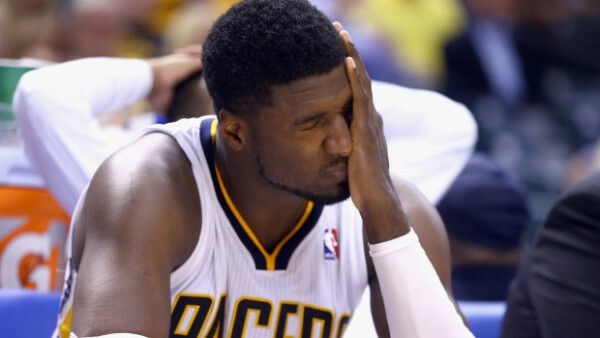 The Pacers proved that by beating the Hawks in seven games, but how much longer can they pull off this trick? Arrogant, uber-confident teams tend to let go when things aren’t going well. Leaving the fighting for better opportunities. Maybe the Pacers are that rare breed of supreme teams who know how good they are and don’t mind “taking naps” in games they find less important than others, knowing that with a little bit of mental switch they’re good to go and win two nights later. But when it happens again and again, one must come to the conclusion that this team simply isn’t good enough to live up to the standards and goals they set for themselves before the season began.